The Sickle Cell Disease Coalition will regularly share news highlighting our collective and individual efforts to change the status quo for people with sickle cell disease. To join our press distribution list, contact press@scdcoalition.org. 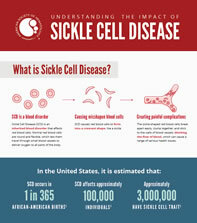 This infographic can help you better understand what SCD is and how it impacts individuals across the globe.